From the moment your child wakes in the morning, he is slowly using up the benefits of the previous night’s sleep. He wakes up totally refreshed, but as the hours pass, little by little, the benefits of his sleep time are used up, and an urge to return to sleep begins to build. When we catch a child at in-between stages and provide naps, we build up his reservoir of sleep-related benefits, allowing him a ‘fresh start’ after each sleep period. 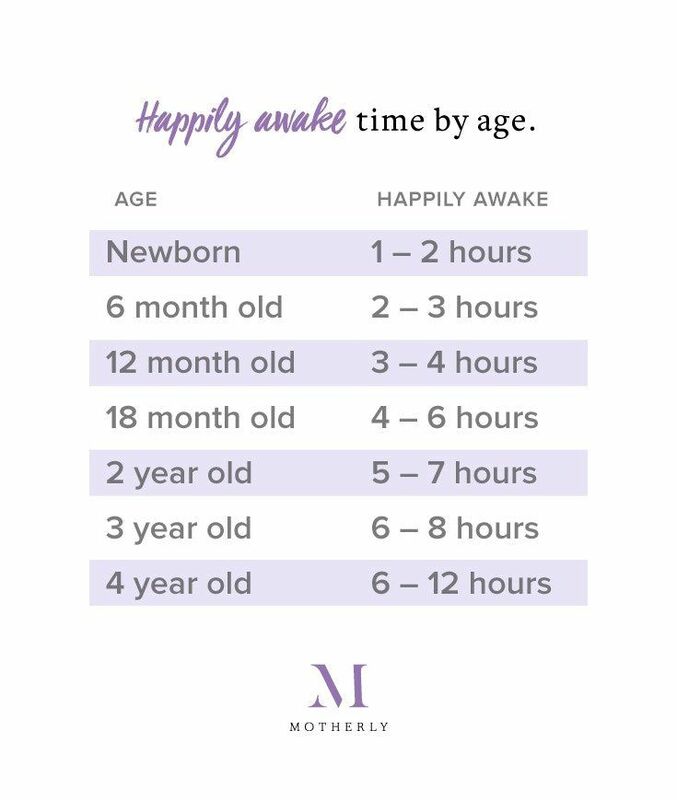 As shown below, as children age, the length of time that they can stay ‘happily awake’ increases. A newborn can only be awake one or two hours before tiredness sets in, whereas a 2-year-old can last five to seven hours before craving some down time for a nap. When children are pushed beyond their biological awake time span without a break that’s when they become fatigued, fussy and unhappy. As the day progresses, and the sleep pressure builds, a child becomes fussier, whinier and less flexible. He has more crying spells, more tantrums and less patience. He loses concentration and the ability to learn and retain new information. As a child progresses through his day, his biology demands a sleep break to regroup, refresh and repair. If a child does not get this break the problem intensifies—the rumblings and tremors become an outright explosion. Without a nap break, the homeostatic pressure continues building until the end of the day, growing in intensity—like a volcano—so that a child becomes overtired, wired and unable to stop the explosion. The result is an intense bedtime battle with a cranky, overtired child, or an infant who won’t fall asleep no matter how tired you know he is. Over time, as a baby’s sleep cycle matures, he will be able to go longer periods between sleeps. It is not until age 4 or 5 that a child is able to go happily through the entire day without a nap, and sleep research suggests that even through adulthood a midday nap or rest break is extremely beneficial in reducing the pressure in all human beings. The Volcano Effect is not something reserved only for children! This biological process affects adults as well. Understanding this can help you interpret what is really going on in your home at the end of a long day, when children are fussy and parents are grumpy—resulting in a whole mountain range of volcanoes. Sleep pressure can be exaggerated by environmental issues such as the previous poor night’s sleep, on-going sleep deprivation or daily stress. This volcano concept brings to light one more important point—quality naps can make up for lost night sleep, but extra nighttime sleep does not make up for missed naps, due to the homeostatic sleep pressure concept. Therefore, no matter how your child sleeps at night, his daily naps are critically important to release the rising sleep pressure.